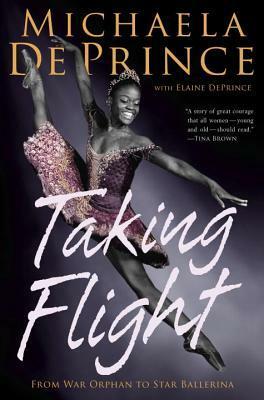 The extraordinary memoir of Michaela DePrince, a young dancer who escaped war-torn Sierra Leone for the rarefied heights of American ballet. Michaela DePrince was known as girl Number 27 at the orphanage, where she was abandoned at a young age and tormented as a "devil child" for a skin condition that makes her skin appear spotted. But it was at the orphanage that Michaela would find a picture of a beautiful ballerina en pointe that would help change the course of her life. At the age of four, Michaela was adopted by an American family, who encouraged her love of dancing and enrolled her in classes. She went on to study at the Jacqueline Kennedy Onassis School at the American Ballet Theatre and is currently a member of the Dutch National Ballet’s junior company. She has appeared in the ballet documentary "First Position," as well as on "Dancing with the Stars, Good Morning America," and "Nightline." A few years ago, I watched the wonderful documentary First Position. It features a group of kids, ranging from about 10 to 18 who are competing at the Youth America Grand Prix for ballet. The featured kids are very diverse, in terms of race, socio-economic class, where they live, family situations, etc. What they all share in common is that they are immensely talented ballet dancers. If you haven't watched the documentary yet, I can't recommend it enough. It's on Netflix. One of the most compelling stories was Michaela DePrince. At the time of the documentary, she was 14 and she was auditioning for ballet scholarships. Now she is 18 or 19 years old and is a professional ballet dancer for the Dutch National Ballet. But what makes her compelling is how Michaela began. Michaela's memoir begins with her early childhood in Sierra Leone. She was in a loving family who, unlike most people in her country, valued girls. But her father was shot by the rebels when she about about 3 and her mother died soon thereafter from illness. Michaela was, in a sense, lucky that her abusive uncle hated girls and tossed her off to an orphanage where she was groomed for adoption by loving American parents when she was 5. The book does not skimp on the horrors of the war in Sierra Leone. Michaela had people violently killed right in front of her and was lucky to escape death herself. The book also emphasizes that the effects of such trauma lingered long after she came to America, and still lingers at least a little today. It was both horrifying and grimly fascinating to read. In some ways, if not for Michaela's childhood in Sierra Leone, her rise to ballet stardom would not be as significant. On the other hand, the rise of any black dancer to the professional rank is significant and this book tackles many of the stereotypes and racism that Michaela has faced throughout her ballet career. Apart from that, Michaela appears to have been raised in a loving family who sacrificed and pulled together for her ballet dreams. I actually enjoyed reading more about Michaela's family than I did about her life as a dancer. Her parents are amazing people. They adopted 6 girls from war-torn West Africa, 3 hemophiliac boys who later died, and had two biological children. I loved reading about Michaela's relationship with her siblings, particularly her sister Mia, with whom she was best friends at her orphanage in Sierra Leone. It's a very fast, compelling read. I got through it in a few hours. My only complaint is that I'm guessing her memories of her childhood in Sierra Leone are embellished a little. For example, she remembers many things her father and mother would say to her that doesn't sound normal to remember at 3 years old. My guess is she had vague memories and they wrote in quotes and anecdotes to fit accordingly. Calling it a complaint is a little strong. It working narratively and I'm guessing was in the spirit of the truth, but it was blatant enough that it pulled me out of the story. But who knows - maybe she really does remember it all. Regardless, I definitely recommend Taking Flight. It's a beautiful, compelling story of a strong, determined girl rising from literally the worst situation in the world to become a beautiful person and an extremely talented dancer. Recommendation: Buy if you're really into ballet; borrow otherwise. I really want to read this book! I've read memoirs by Misty Copeland, Jenifer Ringer, and Gelsey Kirkland, all have been incredibly interesting. As a dancer myself, I love reading professional dancer's stories. Great review! This sounds fascinating. I'll have to check for it at the library. The documentary on Netflix sounds wonderful, too. Thanks for the heads-up!